Tokyo and the rest of Japan truly has it's own culture. It's a densely packed urban area that is driven by technology, wealth, history, and culture. The city lights up at night and comes to life in its own fascinating way. Tokyo is known for its nightlife scene and there's no shortage of neighborhoods where you can party into the early hours of the morning. Do keep an eye on the train schedule though, if you don't want to pay for a taxi back to you hostel or hotel. Most of Tokyo's nightlife is best experienced by heading away from your hostel and finding local bars, clubs, and karaoke spots. Although hostels can offer a great means to meet other travelers, if you want to experience the best party scenes, these won't be found in the hostel bars. For this reason, typical "party hostels" in Tokyo can be a bit difficult to come by. Instead, find a hostel that has a lively bar, make some friends, and then head out on the town together. The hostels below may not be traditional party hostels, but they do often a good setting where you can meet other travelers and find friends to explore the city with. How much do hostels in Tokyo cost? A fun and affordable hostel for backpackers and students. Nue Hostel and Bar Lounge is one of the more lively hostels in Tokyo. There's a great bar and lounge area where many guests enjoy hanging out. They often have music playing and there's good food and drinks available for reasonable prices. If you're hoping to meet other travelers, then this is the place to hang out. On occasion, they even have live music. The hostel is located in the Asakusa area. There are bars, restaurants, and shops nearby and many of the city's sights are within walking distance. Public transportation is also conveniently close by. The hostel has a friendly staff and a social vibe so if you want to make friends, it's relatively easy. The area is safe and the price is reasonable. Despite the lively bar, it's still possible to enjoy a good night's sleep here as well. J-Hoppers Osaka Guesthouse is a friendly hostel located near Umeda Sky building, with lots of bars and restaurants nearby. This clean hostel has Wi-Fi throughout as well as air conditioning, laundry facilities, and a rooftop terrace. There are privacy curtains and reading lights for each comfy bed. The TV lounge has a DVD player and TV. The rooftop terrace is the perfect place to chill out with your fellow travelers and they provide free toast and soup every morning from 8:30-10:30am at the kitchen. There is a communal kitchen which is fitted with a microwave, toaster, coffee maker, rice cooker, cooking utensils, tableware, and more. Free coffee, tea, Japanese tea and various kinds of seasoning are available to use. The facilities also include a beer vending machine, photocopy and print service, local and international phone calls and a fax service. The facility is located in a five-story building with no elevator. Children under 12 are only allowed in private rooms with a parent, they are not allowed in dorm rooms. The hostel hosts weekly events, such as takoyaki parties on Tuesdays, International parties on Fridays, Izakaya parties on Sundays, and more. 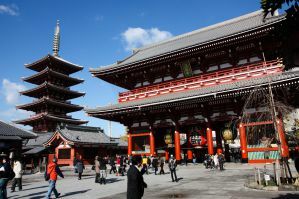 The great location means it takes less than an hour to get to the main tourist sights in the Kansai area such as Kyoto, Nara, Kobe, and Himeji, all accessible by train. Linens are included with your stay and towels are available for hire. A great hostel for backpackers, students, ad solo travellers. This hostel is becoming a popular and fun hostel for young travelers and backpackers who want to make the most of their time in Tokyo. The hostel is located in a small, five story building and there's a fun on-site cafe and bar. There always seem to be people hanging out in the bar, so if you're looking for a few new friends, it's easy to find them. They even offer a free nightly drink at the bar. This is a great hostel for solo travelers because everyone seems open to hanging out. The hostel is located between the Asakusa and Ueno areas and it's near public transportation. There's anything you might need in the immediate vicinity including convenience stores, grocery stores, bakeries, and restaurants. The hostel is affordable and there are dorms available that are comfortable and quiet. The staff here are also travelers themselves and they can help you with any information you might need. Hostel Bushi is only a 5 minutes walk from Kyobashi station. It's directly connected to Kansai Airport, Namba, USJ, Kyoto, Umeda and the Osaka Castle is also very close. So you can easily travel around Osaka and Kyoto by train. The facility has Goemon-Buro (Japanese traditional baths) and Japanese armor you can try on. Frequently, the hostel has parties on the rooftop and in the lobby on every weekend, and many guests joins in, making it a popular way to get to know others. There are many restaurants of Osaka food nearby, so you can enjoy your meal and Japanese culture here at the hostel. The facilities include: Free Wi-Fi access, free shampoo and body soap in each bathroom, free towel and Yukata( Japanese bathrobe), free linens, free toothbrush / hair brush / razor, free water in the lobby, fully equipped kitchen and dining room, free washing machine and laundry detergent, free bicycle, and exchange books.